You know, that you truly know Christ if you walk in obedience to His Word because it’s manifested in the way your live. It’s manifested in your obedience.” In other words, we know that we know God because we keep His commandments. John is teaching that salvation is evidenced by obedience. And, in turn, that obedience contributes to our assurance of salvation. Obedience is a sign that we know God, recognizing that He expects His people to live in obedience to Him. In verse four, John restates verse three with a warning: “The man who says, ‘I know him,’ but does not do what he commands is a liar and the truth is not in him” (1 John 2:4). His point is that if you claim to know God but your life is not changed, then that is a sure sign that you don’t know God. Why? Because the truth of God changes and leads a person to a transformed life. So, when that transformed life is not present, you can be sure that the person never studied or learned the truth; and thus has never know God. Having the empowering of the Holy Spirit makes it possible for us to “walk worthy of God, who hath called you unto his kingdom and glory” (1 Thessalonians 2:12); and that there is no greater joy then to “walk in truth” (3 John 4) and in honesty (1 Thessalonians 4:12; Romans 13:13). Christianity is not just knowing about God or knowing certain doctrines or following certain moral precepts. It is essentially to know God because God wants us to know Him. Jesus said, “This is eternal life, that they may know You, the only true God, and Jesus Christ whom You have sent” (John 17:3). 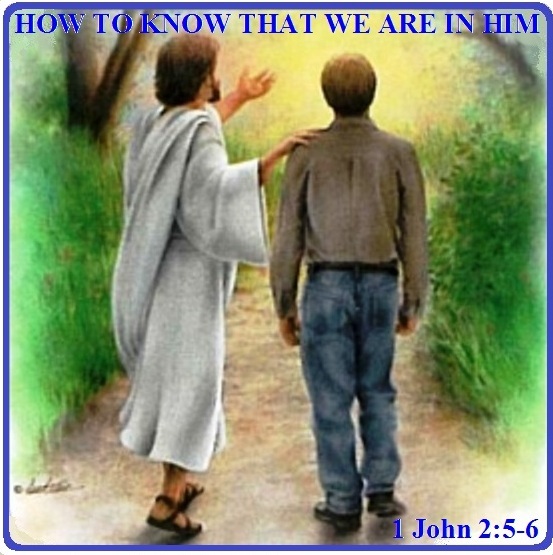 Christianity means knowing God personally through Jesus Christ, who revealed God to us. There is a vast difference between knowing about a person and knowing that person. You may have heard some things about God that may or not be true, but until you have made Him the Lord of your life, you really do not know Him or understand that He deserves to be the absolute Master of your life. In our text, John says that if we are abiding in Christ, we will walk as He walked. This means that He is our supreme example for living. Jesus showed us how we should live in total dependence on the Father and in complete submission to His will, no matter how difficult. Jesus declared, “Truly, truly, I say to you, the Son can do nothing of Himself, unless it is something He sees the Father doing; for whatever the Father does, these things the Son also does in like manner” (John 5:19). He also said “… I always do the things that are pleasing to Him” (John 8:29). While no one can make similar claims, everyone who claims to abide in Christ should have the same focus and direction, not to act in independence from God, but in total dependence on Him. We should not live to please ourselves apart from God, but to do the things that are pleasing to Him. To walk as Jesus walked means that our lives should be characterized by daily dependence on God, submission to Him, and obedience to His will. Our overall aim in life will be to seek first His kingdom and righteousness. We will seek to please Him by our thoughts, words, and deeds. While we will never perfectly walk as Jesus walked, it should be our constant aim and effort to do so. So ask yourself, “Do I know Christ?” Have you trusted in Him as the propitiation for your sins? If so, ask, “Do I know that I know Him?” How? “Do I obey His Word and seek to walk as Jesus walked?” If that is the direction and focus of your life, then you can know that you know Him. We need to understand there are reasons that we obey. We obey because we have to; we obey because we need to; or we obey because we want to. And that the believer obeys God’s word because he wants to – for the relationship between him and God is one of love. Jesus said, “If you love me, you will obey what I command” (John 14:15). We are asking you to look inside your being and answer this question: Are you keeping God’s commandments? While keeping the commandments is not a condition for salvation, it is a sign, an evidence, of your salvation – a mark of a Christian. In fact, partial obedience is another name for disobedience. This was just great! Thank you for sharing this. With so many claiming to be Christians in the world and yet living in continual sin it was refreshing to my soul to read your words of affirmation that we obey BECAUSE we love Him. Very well written post. Appreciate your ministry! Thanks, amen and many blessings to you.